Every year on April 22, more than one billion people take part in Earth Day. Across the globe, individuals, communities, organizations, and governments acknowledge the amazing planet we call home and take action to protect it. 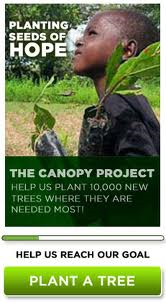 One fabulous Earth Day initiative is the Canopy Project. It aims to plant trees that help communities – especially the world’s impoverished communities – sustain themselves and their local economies. A wonderful by-product of this project is that so many animals have their habitats restored. Trees reverse the impacts of land degradation and provide food, energy and income, helping communities to achieve long-term economic and environmental sustainability. Trees also filter the air and help stave off the effects of climate change. 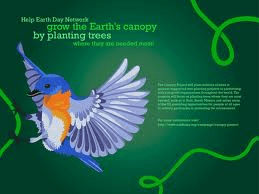 That’s why, earlier this the year, Earth Day Network made a commitment with the Global Poverty Project to plant 10 million trees over the next five years, many of them in the world’s most impoverished places. Wonderful examples of The Canopy Project can be found all over the globe, including here at home. Landcare Australia worked to help restore vulnerable areas of metropolitan New South Wales and Victoria, focusing on places with unique and threatened animal species. In Brazil, the Canopy Project worked with local communities to plant native trees to help restore the Atlantic Forest, one of the most biologically diverse and severely threatened forest ecosystems in the world. Tree Canada joined the Avatar Home Tree Initiative to restore 800 hectares of pine forest that was devastated by hurricane-force winds in 2005. This entry was posted in Home and Family, Nature and tagged Atlantic Forest, Avatar Tree Initiative, Earth Day, Global Poverty Project, New South Wales, Reforestation, The Canopy Project, Tree Canada by jenniferscoullar. Bookmark the permalink.